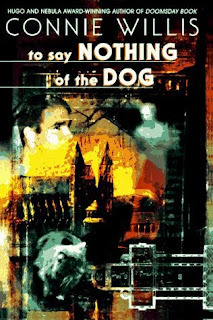 For the last 2016 meeting of City Lit Books' Weird & Wonderful club, we discussed To Say Nothing of the Dog, Connie Willis's 1997 Hugo-winning comic time travel novel. Set in the same world as the more serious "Fire Watch", The Doomsday Book, and others, To Say Nothing of the Dog follows a group of Oxford-based "historians"--time travelers--who study different periods. In this story, the mechanisms (and mechanics) of time travel have been pressed into service for a seemingly-trivial task by a wealthy philanthropist: tracking down decorative pieces of Coventry Cathedral through time, so that they can be either recovered or recreated in the time travelers' "present". Unlike Willis's other time-traveling stories, however, this one is predominantly comic (despite the possibility of collapsing the space-time continuum), reveling in wordplay, slapstick, and overt allusion and homage to its comic British inspirations, including P.G. Wodehouse and Jerome K. Jerome. Without spoiling it too directly: a number of us guessed way in advance that the butler did it. And correctly so, as it turns out. However, we spent a bit of time talking through the very ending of the book--the resolution/mystery-solving is a bit obtuse, and we really aren't presented with enough clues, as readers, to figure it all out. Along with comic novels (including "comedy of manners" types like Wilde), To Say Nothing of the Dog also refers to and draws heavily on the mystery/detective genre. We talked a bit about Arthur Conan Doyle and Agatha Christie's work (Christie's The Man in the Brown Suit  is suggested as an excellent and often-overlooked read), and how Dorothy Sayers fans are likely to really appreciate the Harriet/Peter Wimsey proposal homage. Unsurprisingly, we spent a lot of time talking through the time travel mechanics. While I very much enjoy the novel, and much of what Willis does makes sense from a narrative perspective, the time travel ultimately doesn't work for me for technical reasons (which I attempted to sketch out in group). Willis (or at least her characters) can't seem to decide the nature of the space-time continuum here, which is actually quite important to the stakes and mechanics of the story. All of the historians seem to be operating under the supported, reasonable theory that alterations to the timeline are both possible and possibly catastrophic, with the caveat that small changes are self-correcting. However, this view seems extremely inconsistent throughout the novel: at times they seem to believe that alternate timelines are (briefly?) 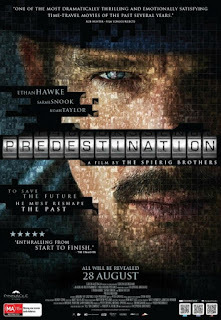 possible, at other that the timeline is singular (and thus time traveling "interference" was "always" fated to happen). If paradoxes are truly impossible, then Ned & Verity struggle in vain--there's no actual threat to the timeline. However, the idea of a totally paradox-free, unified timeline only works with some highly artificial narrative wrangling, in this case in the nebulous machinations of "the net", which is definitely *partially* artifactual (controlled by historian-run computers and mechanisms), may be acting with some kind of "mind of its own" (which seems the clearest reading of some sections), or is merely being manipulated by far-future actors. It's all a bit of a mess, and while in this novel it leads to a narratively pretty bow, it rubs me kind of wrong, and makes me want to find (or write) something about why. But! As you can imagine, led to a very interesting discussion. Also gave a shout out to Slaughterhouse-Five, which embraces the idea that time can't be "changed", although that doesn't subtract value from anything. We also spent a good part of the club talking about other time travel/perception works, including Ted Chiang's "Story of Your Life" (1998) and its recent film adaptation as Arrival (2016, and which I had some thoughts on), Heinlein's "All You Zombies" (1958; pdf link) and its film adaptation as Predestination (2014). We really dug the characters here, broadly-painted as some of them are: they really strike with an impression. I'm personally a huge fan of Lady Schrapnell as a character, and the hilarious juxtaposition of "universe-threatening paradoxes, but Schrapnell's actually scarier". Also: some discussion of what exactly a bird stump is. Great discussion! With many delightul (and sadly unrecorded) digressions on Spanish film directors and the lingering effects of Puppygate/Gamergate. For January, Weird & Wonderful is reading "The Left Hand of Darkness" by Urusula Le Guin. Don't forget to check out City Lit Books for their many other clubs and events!